Follow these six simple steps to make your family reunion invitational flyer in minutes. 1. 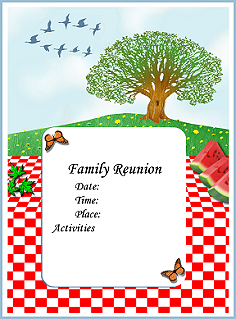 First select and download a printable family reunion flyer template. Many full featured flyer templates can be found simply by using the keywords "family reunion flyer" at top search engines such as Google, Bing or Yahoo! After downloading your flyer template import it into your Ms Office or compatible document editor. 2. Reunion Theme - Locate the text boxes on the flyer template. Text boxes allow the user to enter and edit text over the flyers embedded graphic. The theme should be positioned near the top center of the flyer above all other text to be entered. Experiment with various font colors, faces and styles such as bolded, large size text. 3. Family Reunion Slogan - Now add the family reunion slogan. This can be centered within a text box under the theme using a smaller sized font. 4. Family Reunion Date(s) - Now enter the family reunion date(s). Although numerical month, day and year is sufficient it's usually best to spell out the day(s) and month so users will know exactly what day of the week they are to attend. 5. Family Reunion Activities - List as many planned activities under the date text box as available space allows. List activities according to rank of importance or significance while including those that will appeal to the majority of attendees. 6. Contact Information - Add full name(s), email address, home and cell phone numbers, fax and family reunion website address and any special RSVP deadline instructions. Fimark's Family Reunion Planner Social - An award winning event planning web app with everything you need to plan your next family reunion. MyEvent.com - Personal event planning website with tools to create a family reunion web site, history page, family tree and essential tools to plan your family reunion event. The Family Reunion Planner Guide & Keepsake Book.